Widespread electronic scrutiny is usually denounced as a creature of political tyranny or corporate greed. But the rise of omnipresent surveillance will be driven as much by ordinary citizens’ understandable—even laudatory—desires for security, control, and comfort as by the imperatives of business and government. “Nanny cams,” global-positioning locators, police and home-security networks, traffic jam monitors, medical-device radio-frequency tags, small-business webcams: the list of monitoring devices already deployed by and for average Americans is already long, and it will only become longer. Extensive surveillance, in short, is coming into being because people like and want it. A decade on, it’s clear that Mann and Farmer could not have been more right. With nary a backward glance, Americans have bought hundreds of thousands of Internet-connected video cameras and aimed them at checkout counters, baby cradles, living-room couches, and pet kennels across the land. Add to all these stationary cameras our camera phones, dash cams, and sports cams, and there’s hardly a holdup, traffic accident, tremor, or meteor strike that goes unrecorded. To George Orwell, or even to the average member of pre-9/11 society, this would have been a startling development. But the amount of public hand-wringing heard today over the arrival of ubiquitous surveillance is roughly zero. A few bloggers think Google Glasses are creepy, but a far more common complaint is that they’re deeply unfashionable. The American Civil Liberties Union worries about warrantless wiretapping, but video surveillance isn’t one of the “key issues” listed on its website. How did this happen? When did we stop worrying and learn to love our surveillance cameras? I’d argue that you can attribute much of the shift to the way a few next-generation security-camera companies have positioned their products—and to a few key technology decisions at these companies that have reduced the risk of privacy disasters. To find out how one startup has navigated these potentially hazardous shoals, I visited this week with Greg Duffy, the co-founder and CEO of Dropcam. 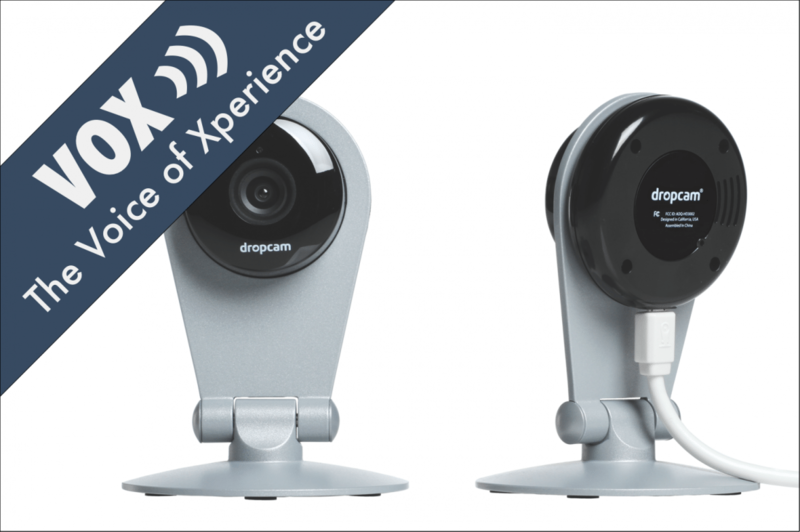 The San Francisco-based company makes a $149 gadget called the Dropcam HD, which connects to your home Wi-Fi network and sends a continuous, high-definition video signal to Dropcam’s cloud servers. You can connect to the servers from any Web browser, iPhone, iPad, or Android device and watch the video in near real time—there’s a delay of a second or two. You can also listen in on the action via the camera’s microphone, and send voice messages back to the camera’s built-in speaker via a push-to-talk feature. All in all, it’s the same sort of Internet Protocol-based security video technology that’s been used for years in retail locations, garages, and other public spots. But the video is captured at a higher resolution and a drastically lower price point, and without the hassle of having to store the data on local servers. The four leading uses for the Dropcam HD, according to Duffy, are home security, child monitoring, pet monitoring, and small-business security. Of course, there are a number of wackier edge cases. More than 100,000 viewers logged on to see video from one boat owner’s Dropcam during Superstorm Sandy. Firefighters have attached the devices to their helmets to help fire chiefs see what’s going on inside burning buildings. One pet-store owner attached a Dropcam to the back of a tortoise, just for fun. In my own case, I used a loaner Dropcam this week to verify that—as I had feared—my dog barks a lot when I’m not home. Most users leave their Dropcams running all the time, even when they’re home, which means they catch everything people say and do. And I mean everything: in one Dropcam video I saw, a homeowner is absentmindedly scratching his behind just moments before the family cat goes crazy (which turns out to be the cue for an earthquake). Duffy says he and co-founder Aamir Virani have been thinking and talking about the potential privacy implications of full-time home video monitoring ever since they started the company four years ago. “If you ignore the social issues surrounding the products you create, you are asking for society to use them in a way that you didn’t expect and maybe didn’t want,” Duffy says. He says there are three major protections in place to prevent video from being misused or improperly accessed. Having recently experienced a pretty horrific criminal act focused on part of my home property I have installed extensive external security cameras. I can pick up the video link anywhere there is an on line connection and I must say this offers great peace of mind. The Dropcam internal option is certainly a product I will be exploring, accepting the usual comments about potential invasion of privacy, this type of product does offer a cost effective solution. If you require the product to be tested / endorsed in the UK…let me know! or during emergencies so that responders can see firsthand what is going on. It’s the best of both worlds for – safety and privacy. Dropcam is good when it works, had a buffering problem on their website yesterday and today I’m not getting notifications for motion detection which is a HUGH factor in making you feel safe. Sorry to hear you’ve experienced some buffering and notification problems. I see you’ve reached out to our customer support team and are in email contact with us. Please reply to the support ticket if you’re still experiencing problems so we can help. Everything seems to be working fine now. Thanks. I have 2 Dropcams and LOVE them. I was recently hospitalized and was able to monitor my home, pets, and friends who were looking after them. I am looking to add another Dropcam by the end of the year. I recommend Dropcams to everyone I know that needs an affordable and reliable security system. I love my dropcams. Too bad my insurance company (AllState) does not recognize them as real security service. I think they are far more useful and far more private than ADT and other human-in-the-loop services. The only reason the insurance company don’t recognize Dropcam or any other WiFi network camera because it’s very easy to “cut” the wireless connection with a simple phone jammer. About the other comments: I think the article is more about the privacy implications rather than how cool is the device itself. I think the hardware is brilliant, but the cloud requirement makes it a Big Brother’s eye on your home. There is no real privacy effort in ANY of these companies, they love data. They consume your video feed, highlight motion, do whatever analysis they want and then allow you to see/use it. The key is they’re reserving the right to do whatever they want with it in the future. You can clearly see that by the complete lack internal LAN support (without internet) or the fact that they are not encrypting the data with YOUR key. This later fact allows them to process your video and watch it as well as hand it to NSA of any other law enforcement agency if they’re ordered to (no matter what the founder says). The truth is that, although everything can be hacked, there are ways to provide real privacy. The device could encrypt the data with a key you create and upload to the cam (the public part of the key). Dropcam servers won’t be able to process the data and even in the case the NSA ask for it they won’t be able to decrypt it easily. On the other side, on every device you want to have access you’ll have the secret part of the key that will allow you to see the video feed. Done. I love my Dropcams as well! Have been using one of them in my living room and one in our garden with one of the cases from dropcamcases.com. Awesome product!